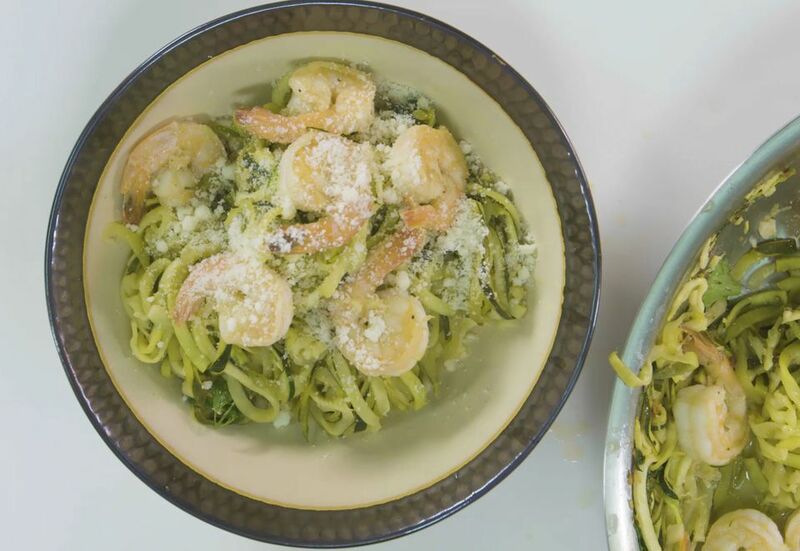 Searching for a healthier version of shrimp scampi? Look no further than this recipe! Not only does it swap out carb-heavy noodles for something greener and just as delicious, it only takes 20 minutes to make. Using noodles spiralized from zucchini make prep time significantly shorter. No longer do you have to wait for water to boil and worry about cooking pasta to the perfect al dente texture. Just toss the zoodles with shrimp, lemon, red pepper, and parsley, then top with Parmesan cheese to make a delicious meal that's just as satisfying. Create zoodles by running the zucchini through a spiralizer. Season the shrimp with the salt and pepper. Heat the butter and oil in a pan over medium heat. Once the butter melts, add garlic and shrimp. Cook shrimp for 2 to 3 minutes, until pink and cooked through. Remove the shrimp and set aside. Add lemon juice and vermouth to the butter, oil, and garlic mixture, scraping up any browned bits (also known as fond) stuck to the pan. Bring to a simmer for 1 to 2 minutes to cook off the alcohol. Add lemon zest, chopped parsley, and red pepper flakes and stir to combine. Add the zucchini and saute for an additional 1 to 2 minutes until the “noodles” become slightly tender and are coated in the sauce. Stir the shrimp back into the noodles. Serve with freshly grated parmesan cheese.